Neodymium ring magnets are being designed into a new generation of motors, generators, hydraulic cylinders, pumps & sensors. They also remain popular in high-end loud speakers & high-intensity separators. • HSMAG ring Neodymium magnets are magnetized through the thickness. • Uncoated neodymium magnets may corrode in humid conditions. Our strong ring neodymium magnets N35, N38, N40, N42, N45, N50 and N52 are in many sizes. When we call ring magnet, tube magnet, or maybe permanent magnets rare earth strong ring neodymium magnets, they are very similar, just the height or length are different. The ring neodymium magnets are always used in speaker, jewelry and home-office condition. The magnetized direction is always through axial, but some customers use it to assemble their sensor, then the magnetized direction is through the dialectally. Rare Earth Ring Magnets are often used in joinery and shop-fitting as they may be recessed and screwed into position. Although not as strong as Neodymium discs, the hole in centre of the ring magnet ensures great versatility. This type of permanent magnet can be used in science projects or experiments, medical applications, cabinetry, water conditioning, loudspeakers and other commercial and industrial purposes. The higher permeance coefficient makes Neodymium ring magnets ideal for many applications. Neodymium rings are one of the most popular shapes of rare earth magnets. 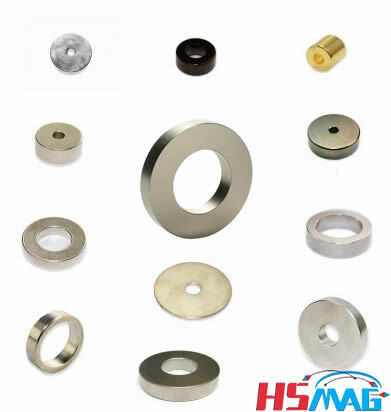 HS Magnetics supplies a wide range of ring magnets in different sizes and with several different coatings such as Nickel, Zinc, Epoxy or Gold to prevent and reduce wear and corrosion.